South Asian American Femininity: Who Can Play? 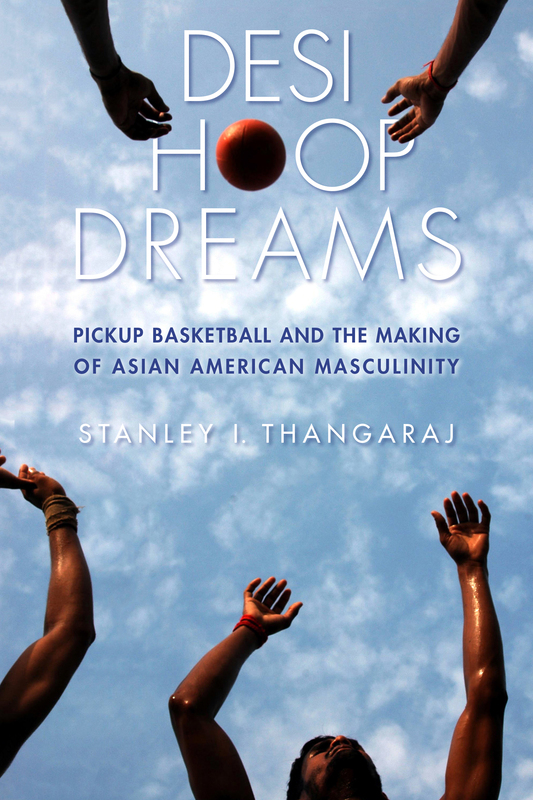 The following is an excerpt from the forthcoming book Desi Hoop Dreams: Pickup Basketball and the Making of Asian American Masculinity (New York University Press, 2015) from Stan Thangaraj, a City College professor of Anthropology and friend of Tropics of Meta. This passage comes from Chapter 5, “Breaking the Cycle.” which consists of a series of fascinating vignettes about contests over identity among Asian American basketball players in the South. Women are present at [desi basketball] tournaments. Their presence constitutes part of the pleasure men take in performing athletic masculinity. The men become the main targets of gaze for a wide audience. Additionally, many women play an important role in providing validations of masculinity. They are key players in the game of South Asian American masculinity. South Asian American women played active roles in the maintenance of Indo-Pak Basketball. The type of roles they took on, both on and off the court, complicated the notion of sports as a “male preserve” (Theberge 1985), though women’s exclusion from playing ideologically and corporeally legitimated basketball as an activity for men. Young desi men ideologically solidified the acts of playing basketball as masculine while they gendered the other types of work at tournaments (such as bringing in food, caring for players, and maintaining the venue) in ambiguously gendered terms that failed to dismantle the gender binary. Women’s presence at tournaments and their absence from playing on the courts did not mean they were powerless dupes at the mercy of men and the system of patriarchy. Rather, South Asian American women found ways to assert agency and stake a claim to desi identities. Some found that agency through the spaces available to them at Indo-Pak Basketball tournaments and dance clubs, while other women worked outside these leisure spaces to assert agency. Furthermore, there were cases of women not following the rules of South Asian American femininity to be “traditional,” “virginal,” “fragile,” and “chaste.” As exceptions, these women confirmed the very mythical norm their presence challenged. Their exceptionality only further substantiated the boundaries of femininity and masculinity as distinct. South Asian American women’s inroads into small cracks and crevices of agency showed the limited possibilities of systemic change within one social realm of diasporic and national identity formation. Her presence on the boys’ team did not put in jeopardy the gendered, sexualized identity of the boys. She explained, “I had to wear T-shirts while boys wore tank tops.” Although she was in the same league with boys, she was still configured as different in ways that affirm binaries of male-female and masculine-feminine. One key example consisted of the uniform she wore that differed from that of her male teammates. Tank tops are seen as appropriate attire to showcase the male body and its respective muscularity. Madeleine’s body could not be shown in the same way, as women are ideologically constructed as bystanders and spectators to this gendered space; she had to wear T-shirts to cover up her arms and chest in order to admit feminine difference. Her body was too naked with the traditional basketball tank tops and would disrupt the taken-for-granted value of sport, especially basketball, as masculine and for boys. Playing with the guys allowed me to surpass racism because people wanted me on their team. . . . [The university (a Division I collegiate basketball program)] was where I went because of academics and athletics. I got offers from many SEC schools [SEC is the Southeastern Conference, a collegiate athletic association with a superior basketball conference] . . . . Lots of people, like coaches, thought I was black; they made these sharp judgments. . . . People viewed me by my skin color [Her parents are Malayalee and from South India; she has dark skin and is thus part of the population originally referenced as “Kallu”] . . . . Because of my skin color there are perceptions of me as physically and racially black. Madeleine was an exception to the rule that South Asian American women do not play basketball. Yet her exceptionality did not dismantle the gendered system of inequality; rather, it reinforced it. Madeleine did not play with other South Asian American girls; that opportunity did not present itself in the mid-1980s for Madeleine and is not easily available for young South Asian American women now. By playing with the “guys,” she was able to move through the racist and sexist structures of sport as a “tomboy” or as “one of the boys.” There were multiple racial meanings that were mapped onto her body, but the blackness ascribed on her female body differed from the ways the young male players took to cultural blackness. Like the young desi men who consumed elements of cultural blackness to navigate sporting realms, Madeleine’s misidentification as “black” gave her room to move as a young athlete. This misidentification served her productively as she got a chance to play basketball and to move up the basketball hierarchy. Accordingly, the blackness projected upon her allowed possibilities of athletic excellence, competitiveness, and aggression. The blackness was a point of difference from South Asian American femininity that made her presence on the court acceptable, even normal. She did not wholly reject or dis-identify with blackness regardless of how desi communities understand it. Desi communities construct South Asian femininity differently from black femininity. South Asian American women are considered traditional, demure, passive, and heterosexual. As a result, women are not seen as having the bodily or cultural toolkit to navigate the competition realm of the basketball court. Madeleine mainly entered spaces through a misidentified blackness that was not always readily available for other South Asian American men and women. Madeleine used her mother as an example of the dominant reading of South Asian femininity: “My mom was very subservient to my dad. My mom’s life revolved around her three kids, no hobbies of her own. Her own desires took back seat to family.” Here, Madeleine linked play and hobby as activities for men, positioning women outside the realm of leisure. Her mention of “subservience” is one of the traits that constitute the conservative realm of gender roles, associating South Asian women with tradition, domesticity, and cultural stagnation. Madeleine’s description of her mother invoked an essentialist paradigm of South Asian American femininity that erases other possible desires and pleasures outside of domesticity. Even Madeleine’s take on the necessary traits for basketball success affirmed this dichotomy: “In order to participate [in basketball] you need to be assertive. . . . [You] cannot be meek or weak. . . . [You] need to take control. . . . [I am] not sure how much of it [feminine subservience and weakness] is culture and how much is my own family.” Although women challenge these ideas of passive domesticity every day, social convention indexes women as passive while men are marked as aggressive (see May 2007). Toughness, aggression, and competitiveness were deemed masculine traits that were to be superimposed on male bodies. The notion of female masculinity was an oxymoron for the male players. When Madeleine and male Indo-Pak Basketball players conjured up a traditional portrait of South Asian femininity, it was a result of prevalent ideologies within South Asian America and not solely those within South Asia. The conservative gender ideologies embodied by myinterlocutors erased and hid the complexity of South Asian feminism and queer politics. For example, Madeleine dislocated herself from “Indian-ness” instead of complicating what Indian-ness could mean when she says, “I was not a ‘good Indian.’ I was not a typical Indian.” She conflated “typical” and “good” and saw basketball excellence as a marker of “bad” and “non-typical” Indian-ness. As muscularity, toughness, and competitiveness in sports are often described as corrupting of the female body, leading to loss of femininity (see Farooq Samie 2013; Joseph 2013), the “good” stands in for bodily performances of a sexually attractive but non-athletic femininity. Despite all these ideological constraints on South Asian American femininity, Madeleine excelled in basketball. She played in a premier Division I collegiate program and set several university records. Such accomplishments should make her a well-known figure within the South Asian American community. But her choice to excel in mainstream sport did not immediately open doors in South Asian American basketball circles: She was neither recognized nor given accolades. Madeleine was in many ways a non-being and an impossibility—she, along with other basketball players, is rendered outside of femininity. Men in South Asian America and in larger U.S. society get disproportionately more media coverage regardless of the excellence of female athletes. As a result, Parambir, for example, who played for a Vancouver Indo-Pak team, received greater attention. His male body was often the topic of conversation at Indo-Pak tournaments, which perpetuated the celebration of men at the expense of the achievements of women. Earlier we saw the idolization and reverence that players had for Parambir. Madeleine had more significant statistical achievements and records while playing at a Division I collegiate program than Parambir. But these achievements did not translate into challenging the masculine symbolic order of basketball. Femininity, in this instance, served the purpose of masculine opposition, and not affiliation. Young South Asian American women could spectate but did not play on the court aside the young men. Madeleine expressed sadness about how few South Asian American women play basketball. I asked, “Do you think there are more opportunities for South Asian women?” She thought deeply and replied, “There are more opportunities now to play ball. It is crucial to see older women playing. The cycle needs to be broken since I know only two Indian women who play basketball.” That cycle can only be broken on both symbolic and material grounds. The current cycle of representation is one that legitimates the mythical norm since athletes live up to the dominant dictates of race, religion, gender, sexuality, and class. For one thing, the symbolic legitimacy of the gender binary (masculine vs. feminine) continues to frame certain sports as masculine and some as feminine. The institution of Indo-Pak Basketball simultaneously creates opportunities and forecloses opportunities for women. Furthermore, the scarcity of female desi players is not a cause for concern in brown-out spaces. Various organizers and team captains at the 2006 and 2008 Chicago IPN worried about the paucity of South Asian American male youth in Indo-Pak Basketball. They reconciled their anxiety through the creation of two tournaments at the 2008 Chicago IPN, an adult Indo-Pak tournament and an under-18 boys’ tournament. A girls’ tournament did not surface here. There is, however, a women’s tournament at the Dallas IPN. In contrast to the men’s tourney, there are far fewer women’s teams. Dallas IPN has instituted a co-ed tournament, but neither that nor the women’s-only tournament draws the prestige afforded to the men’s tournament. If the organizers and participants were to recognize and give prestige to the women’s tournament, that might jeopardize the fragile boundaries of masculinity. If female basketball players were to be read as “tough” and “aggressive,” it would still fail to recuperate the queered South Asian American male body as “masculine,” “tough,” and “heterosexual” when the court space is gender integrated. Few sporting opportunities have existed for South Asian American women. The prevailing belief has been that one could not be feminine and heterosexual and participate in basketball. However, desi women could participate in a variety of other sports and still maintain many of the symbolic foundations of South Asian American femininity. These other sports were ones that were already gendered and sexualized as heterosexual feminine. Madeleine recognizes the rarity of South Asian Americans in basketball but notices their active participation elsewhere. “Tennis players are Indian at Alabama University [her place of employment as a basketball coach].” Tennis, in opposition to basketball, is infused with elements of middle-class respectability and gender difference. This middle-class respectability in tennis is imagined through heterosexual femininity and the differential structuring of this sport for men and women (such as dress code and duration of matches). Thus, one can still be a “good Indian” and play tennis. In opposition to the conventional grounding of tennis as heterosexual, in women’s basketball the specter of the “butch” is commonplace. By labeling female basketball players “butch,” the possibility of athletic achievement and basketball femininity is erased. The butch exists outside the confines of the feminine. By using the label “butch,” South Asian Americans expel certain women and locate lesbianism outside the boundaries of South Asian nations and South Asian diasporas. A dislocation of this sort then constitutes culture, diasporic identities, and national identities along lines of “homogeneity, equivalence, normativity, and essence” (Ferguson 2004: 118). Madeleine challenged this singular conception of South Asian femininity by proudly claiming her “bad Indian” status. While “good Indian” categories limit membership and undergo greater regulation, being a “bad Indian” allows her to create multiple affiliations, connections, and performances of self. The association of “bad Indian” with “butch” further expands on the possibilities of identity formation. The butch figure haunted my informants’ conceptualizations of femininity and basketball in ways that demand a regulation of femininity and masculinity simultaneously. When I asked Ali about the WNBA (Women’s National Basketball Association) after a long discussion of the NBA season in 2009, he replied, “Basketball is physical. I don’t think basketball is a women’s sport. I hate the WNBA. I hate it when they act masculine. Chest bumps, tattoos, pounding the chest, and the gear are masculine and childish. They are butch.” By labeling the participation of women in basketball as “butch,” Ali flattened the possibilities of femininity while marking the “butch” as a failed femininity. His diatribe illuminated the anxiety regarding adult female participation that can invert the gendered meanings of basketball. Gender conservatism of this sort is part of the diasporic engagement with mainstream American culture. Part of the gendered access to basketball stems from the patriarchal, heterosexist structure of major U.S. sports, not simply South Asian cultures (see Messner 2002). The sports scholar Tiffany Muller (2007), in her examination of the ways in which sexuality resurfaces in the WNBA, contends that the WNBA creates media events to explicitly portray women’s basketball as appropriately feminine by foregrounding heterosexuality with “family nights.” These intentional “family nights” are ways to counter the stigma of “butch” given to female basketball players. Although players on the South Asian American basketball circuits might share this homophobic sentiment about female basketball players, it is a bit more complicated than that. Ali shared his disdain for women in basketball yet took satisfaction in emphasizing how his toddler daughter will be a great basketball player: “Yes sir! She is going to be a player. She can already play. You got to see how she bounces and holds the [basket]ball.” His daughter did not play on the court at the same time as him or his co-ethnic peers. She did not compete against him in pickup basketball or tournament play. Thus, his daughter did not immediately threaten the masculine coherency of basketball, as he was the father passing down sporting expertise to his child. Adult women, however, constituted the outcasts in the realm of basketball play. They were present in the basketball venue and found their own ways to assert agency. Stan Thangaraj is an assistant professor of Anthropology at the City University of New York’s City College, with interests in race, gender, sexuality, class, and ethnicity in Asian America in particular and in immigrant America in general. He is a former high school and collegiate athlete and coach who considers sport a key site to understand immigrant enculturation, racialization, and cultural citizenship. His key communities of study are South Asian American, and he looks at the relationship between citizenship, gender, race, and sexuality as critical to understanding diasporic nationalism. Prof. Thangaraj has two new projects. His first project examines how Kurdish American communities embody, negotiate, challenge, and manage U.S. Empire. Instead of juxtaposing Muslim Kurdish women as victim of Islamic patriarchy, he is interested in how women assert agency and form identities on the ground while challenging mainstream U.S. racializations of them. The second project explores the spatialization of race, class, and sexuality in the construction of the Civil Rights narrative at the Civil Rights Museum in Memphis, Tennessee. In this project, he looks at the relationship between celebrating Civil Rights history, the propping up of heterosexual black nationalism and social movements, and the gentrification that follows this discourse. Stan Thangaraj takes his intellectual inspiration from Women of Color Feminism and Queer Theory. © 2015 New York University Press. Reprinted by permission of the press and the author. Wow! I did not realize the double standard went this deep, but then the double standard vanishes when the throne is being passed down? Amazing how eye opening this excerpt teuly is!